Multi-function solid brass control valve. Self-powered by Water. No Battery nor Electricity needed. Stainless steel shower hose double hooked Ø0.55"
Body : Made of heavy solid brass for durability & reliability. Valve: Equipped with drip-free ceramic disc valves for long life and smooth feel. The shower head's pretty good. We've had no trouble with installing it and getting it to work. The LED lights are nice, though I agree with the other comments that it could've been brighter. I got the 12 inches of this one by the way, and if you were to ask me, I'd say the bigger the size the better. The only issue I have with this is the LED lights, which isn't easily visible during daytime, especially since we have rather large windows in the bathroom. The only reason why I'm giving this shower system four stars is because of the LED lights, which appears pretty dim to me. I would love for them to be brighter. But aside from that, this thing works great. I never thought I'd care so much about a shower set as to leave a comment about it, but I think that this thing deserves a good word or two. After all, it's been working excellently since we had it installed a couple of weeks back. I was thinking that the LED lights would be busted any time soon, but they didn't. Hopefully they stay that way for a long time. We've been searching for an LED shower head since we first saw it in a hotel we stayed in our last vacation. When we came here, we saw several shower heads that we liked, but then we saw this in the side and thought why not get the whole set instead? So we did, and great decision at that, too. 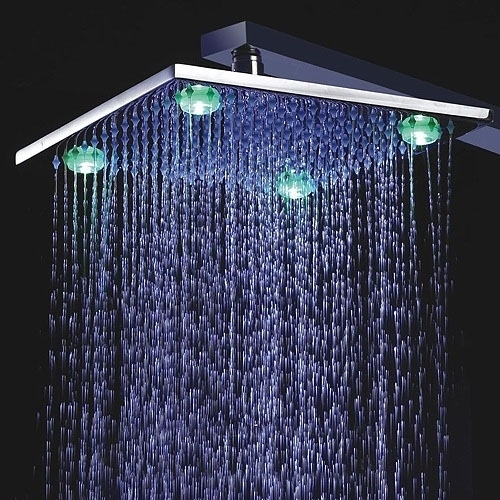 Not only do we enjoy the LED lights every time we shower, but the handheld as well.